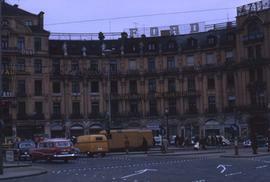 Colour Kodachrome 35mm slide depicts a building in the background with several signs, including the word "Ford", on it and a street with cars in the foreground. Oral history interview with Daphne (Mrs. Eugene) Mahrer. Oral history interview with Dorothy Grad who was born in Vancouver and active in Bazaar, Beth Israel Sisterhood, Hadassah and Jewish television programming. She married Irving Grad in 1955.